The Team Shortcode has a few options, such us layout type, columns number, checkbox for adjustment gap between columns and color settings. Before use it, please ensure, that you fill needed fields in Team Post Type (Team in Admin Panel). For all outputted team items apply layout type, that defines the way of displaying single team item (watch structural preview shown below). 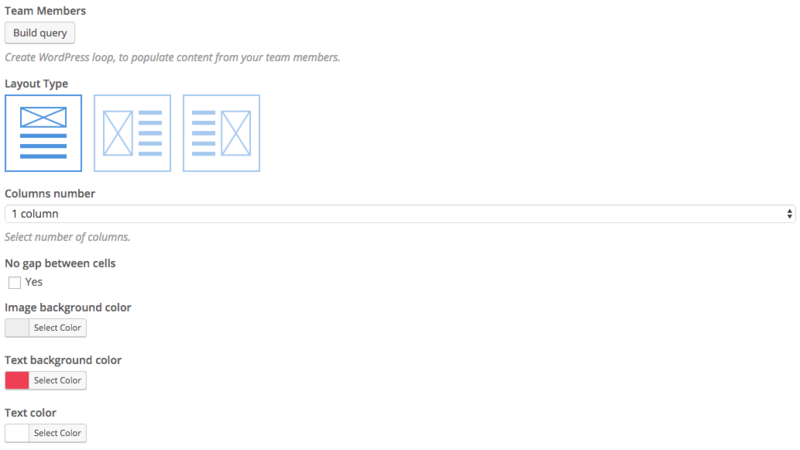 You, also, are able to set team members, it’s may be useful when you want to define different layout type. For this, you should build query consist of concern members using “build query” button, thereafter add another Team shortcode with its own team members and layout type.